Gothitelle vs Vileplume: Which is the best? It’s Battle Roads time and Trainer lock is looking more appealing with the release of Gothitelle. This segment of the article will be discussing the effectiveness of the new method of Trainer lock as well as comparing it to its predecessor, Vileplume. I hope you guys enjoy it, and help you make that difficult decision of selecting which method is better for your play-style! I run a thicker Donphan line in order to prevent early Catcher KOs as well as provide more early game offensive pressure. I only run 1 Pichu as I find the card to only be useful is certain situations, and feel giving your opponent the opportunity to set up via “Playground” a real setback on occasion. In a format dominated with Pokémon Catcher, it’s important to run at least 3 of all your Stage 2 lines to prevent the deck’s strategy from falling apart due to either all your Solosis or all your Oddishes being Ko’d early on. I run Cheren just for straight draw as opposed to Sage’s Training or other draw cards. This is because the card has been testing really well with regards to maintaining a decent hand size, while not sacrificing negative effects, such as forced discard. 1 Zekrom. This also helps break the mirror match “Lock” by being able to one shot opposing Gothitelles if 120 Damage is put on them as a result of a combination of damage received and placing counters onto Zekrom from Reuniclus’ “Damage Swap”. Much like Jay’s list, I run only 1 Pokémon Catcher, then use Junk Arms to recover it later in the game. The Junk Arms also let you empty your hand of unwanted cards mid to late game to maximise the efficiency of your hand, and as a result, your deck, after using a shuffle draw card to try and draw those cards you desperately may need late-game. 4-4 Yanmega is essential for maintaining a steady stream of attackers and keep up offensive pressure. Jumpluff is used in combination with mew and is indispensable in order to combat the Gothitelle matchup. 4 Judge/4 Copycat for helping to match hand sizes as well as utilising Judge for maximum disruption. Aipom for its ability to “Lock” certain matchups. Jason K used this to great effect against Chris Fulop in the Top Cut Invitational by continuing to “Tail Code” energy off of Fulop’s Magnezone Prime to help him win the match in the end. As you can see, Tropical Beach is included in all the above lists. This is because I honestly believe there is no better replacement for it in the format at the moment. In certain situations, it can really help turn a game around by drawing to 7 while still maintaining a lock on your opponent. It’s also really if you get unlucky with your baby flips and have no other move for the turn. If you guys don’t own a copy yet, I’d advise getting one as soon as possible if you wish to optimise your deck for Battle Roads and Regionals coming later this year. For those not willing to splash the cash, I would strongly advise another Cleffa as opposed to more shuffle draw, as he’s great Twins bait as well as improving the consistency of your list with regards to a higher number of starting basics. After the first week of Battle Roads, certain decks are starting to emerge as dominant decks for the format. 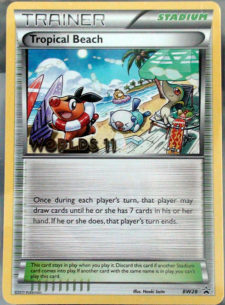 In this portion of the article I’ll be going over what’s been bringing home those Victory Cups as well as discuss the decks that haven’t lived up to their potential. That’s all I have you for this month folks! Feel free to message me for test games as well as deck help/advice for week 2 of Battle Roads!